In the opening moments of Sebastopol Shakespeare Festival's rousing open-air presentation of The Three Musketeers, young D'Artagnan (another fine, spirited performance by Ben Stowe) asks his father how a particularly impressive sword-fighting move is accomplished. "Misdirection, son," explains D'Artagnan's dad. "Get your opponent to lose his focus, then move like lightning." This advice would appear to be the driving force behind this feisty 2006 adaptation of the Alexandre Dumas classic. Dazzling unsuspecting audiences with cleverly conceived swordplay and outrageous one-liners, the light-hearted script by comedy king Ken Ludwig (Lend Me a Tenor, Leading Ladies) employs its own masterful misdirection, skillfully drawing attention away from the fact that The Three Musketeers, as originally written, is frequently dense and boring. Not so with this production. By using Dumas' 165-year-old story as a trampoline, playwright Ludwig bounces from plot point to plot point, filling in the gaps with delightfully goofball dialogue and frisky switcheroos. Wherever Dumas' original story grows confusing and tiresome, Ludwig merely replaces it with clean, purist-baiting alternatives, inventing whole new characters. At times, the script seems less like an adaptation of The Three Musketeers and more of a giddy Cliff's Notes&–fueled tribute to the kind of swashbuckling adventure novels that TTM has since inspired. Directed with fast-paced energy and an eye for spectacle by Ken Sonkin, The Three Musketeers features a terrific ensemble cast, many of whom change character and costume faster than seems technically possible. The bones of the story are the same: young D'Artagnan ventures to Paris with hopes of becoming a musketeer, one of the king's personal guardsmen. Within hours of arriving in the city, D'Artagnan has made enemies of the power-hungry Cardinal Richelieu (a growling, imposing Eric Burke), his one-eyed right-hand man Rochefort (Chad Yarish), the evil-to-the-bone professional temptress Milady de Winter (Bronwen Shears) and the three musketeers themselves: Athos (all-kinds-of-dashing Keith Baker), Porthos (exuberantly on-target Dan Saski) and Aramis (sweetly eccentric Derek Fischer). After winning over the musketeers, known as "the inseparables," D'Artagnan falls in love with the queen's handmaiden, Constance (a radiant Allison Marcom), and becomes entangled in a plot by Richelieu to discredit the queen (Laura Downing-Lee) and wrest power from the king (John Shillington). To these plot points, Ludwig has added Sabine (Emily Brown), D'Artagnan's tomboyish, cross-dressing sister, a change that takes the story down an entirely untraveled alley. In particular, the ultimate fate of Milady, played with smoldering nastiness by Shears, is agreeably satisfying, though quite different from other versions. The reliably chameleon-like Dodds Delzell lends his shape-shifting talents to a number of roles, including the musketeers' long-suffering captain, the Monsieur de Treville, while other small parts are filled by Shillington, Downing-Lee, and Marcom. The real pleasure of this production, presented outdoors in Ives Park, is the heightened sense of glee with which the cast and crew attack the show. Played with the knowing melodrama of a Penny Dreadful, the breakneck pace of an old-fashioned movie serial and the broad comic strokes of a Saturday-morning cartoon, this is the kind of play that makes kids fall in love with the stage and reminds their parents and grandparents how much fun live theater can be. Amid all of the outlandish spectacle and cleverness, there is somehow still space for a few authentically moving moments, one of which—the demise of a major character—is played with heartbreaking sincerity. With a smashing two-story set by Benicia Martinez and lavish costumes by Skipper Skeoch, this show is like watching a skirmish between the visual and the verbal, every new piece of feathered and frocked eye candy warring with some new turn of speech or offbeat remark from the cast. In the end, what many will remember from this Musketeers is the inventively choreographed swordplay. Again, those who revere Dumas' original text are likely to find offense in the cavalier deconstruction being offered up in Ives Park, but for all others, this is the summer show to see, a big-hearted, action-packed confection, luscious and tasty from the first "all for one" to the last "one for all." 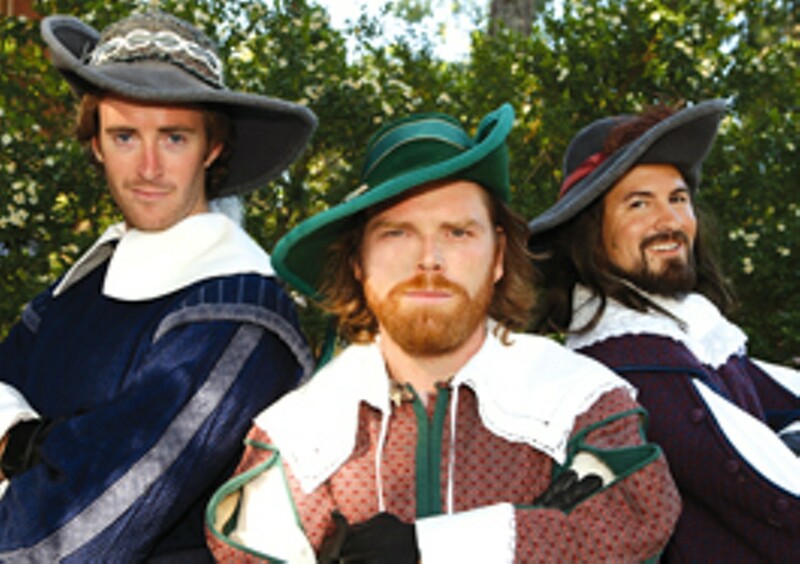 'The Three Musketeers' runs Thursday&–Sunday through Aug. 30 at Ives Park, Willow Street and Jewell Avenue, Sebastopol. 7pm. $18&–$23; Thursdays, pay what you will. Under 12, free. 707.823.0177.